International Desk: New Zealand has broadcast the Islamic call to prayer and observed a two-minute silence in ceremonies to mark a week since the Christchurch attacks. 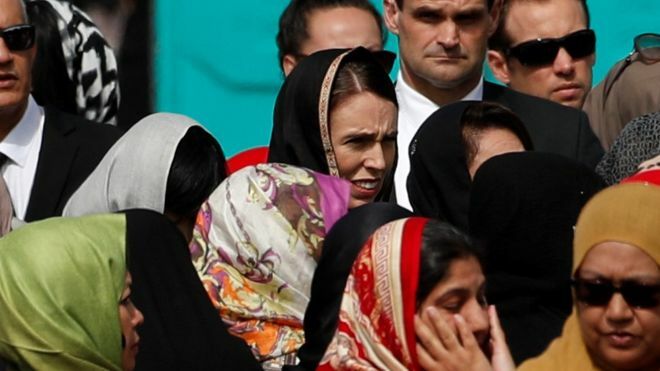 Prime Minister Jacinda Ardern joined thousands of mourners near the Al-Noor mosque, one of two places of worship targeted in last Friday's shootings. Addressing the Muslim community she said: "New Zealand mourns with you, we are one." Fifty people were killed and dozens more wounded in the attacks. Australian Brenton Tarrant, a self-proclaimed white supremacist, has been charged with one murder and is expected to face further charges. On Thursday Ms Ardern announced a ban on all types of semi-automatic weapons. Thousands of people have gathered in Hagley Park, near the Al-Noor mosque, to mark Friday's national day of reflection for the victims. The Muslim call to prayer, or adhan, was broadcast on national television and radio at 13:30 (00:30 GMT) and was followed by a two-minute silence. In an address beforehand, Ms Ardern said: "According to the Prophet Muhammad... the believers in their mutual kindness, compassion and sympathy are just like one body. When any part of the body suffers, the whole body feels pain." Imam Gamal Fouda, who was leading prayers, said the gunman "broke the hearts of millions around the world". "Today, from the same place, I look out and I see the love and compassion," he said. "We are broken-hearted, but we are not broken. We are alive, we are together, we are determined to not let anyone divide us." Many mosques across the country are expected to open their doors to visitors and human chains will be formed outside some in symbolic acts of protection and solidarity. One observer, John Clark, said the message was profound: "People will be rethinking how they react, how they think, and how they speak sometimes - it's penetrated to that level of society. "We like to think that we're a liberal community, but we know that there are dark parts," said Mr Clark, 73. "It will positively affect New Zealand and maybe we'll have even more to offer the world." The thousands gathered to the sound of birds being broadcast over a speaker system. Written on a large screen was the message: "We love you!! Kia Kaha!" - a Maori term meaning "Stay strong". The area closest to the mosque was set aside for Muslim prayer. Further back, thousands of people filled a public area - including many women wearing headscarves. Imam Fouda drew several moments of applause, including when he thanked the police, Prime Minster Jacinda Ardern, and neighbours "who opened their doors to save us from a killer".